Recently, the city of St. Paul unveiled draft plans to redevelop the Ford Plant site. Located along the Mississippi River in the Highland Park neighborhood, the 135-acre former manufacturing campus is now clear of structures and environmental cleanup is underway. City plans call for a "21st-century community" at the site, featuring a "livable, mixed-use neighborhood that looks to the future with clean technologies and high-quality design for energy, buildings and infrastructure." FMR has been closely engaged in the public process around redevelopment planning for the site since 2007. The new draft plans provide the first detailed picture of what the city and Ford Motor Company have in mind for its future. While many elements are praiseworthy, others give some cause for concern. Here are the key issues we recently shared with the city. The Ford site is located along the one and only Mississippi River Gorge, one of the most scenic reaches within our national park. Throughout the planning process, FMR and many citizens argued that the site can and should be redeveloped in a dense and transit-friendly way while also limiting building heights to protect the scenic values of the river. We're pleased to report that the draft plans limit building and structure heights to protect the river gorge's scenic value. Structures closest to the bluff can be no more than 48 feet high, while those along Ford Parkway are capped at 55. Heights are then tiered, allowing taller buildings as you move further from the bluff. Because the topography of the site rises steadily from the river, it's unavoidable that some buildings will be visible from the opposite bank and blufftop overlooks. The outstanding river views from Fort Snelling, the Ford Bridge, Wabun Picnic Area, and elsewhere will certainly be impacted. As a result, FMR is advocating that the city adopts design standards to minimize visual intrusiveness. FMR is excited about the proposed water feature and greenway that could run through the Ford site but is pushing for the city to also consider expanding the thin strip of public parkland along the bluff nearby. As a member of the 2010 Ford Open Space Work Group, we're pleased to see some of the workgroup's recommendations and guiding principles incorporated into the draft plans. 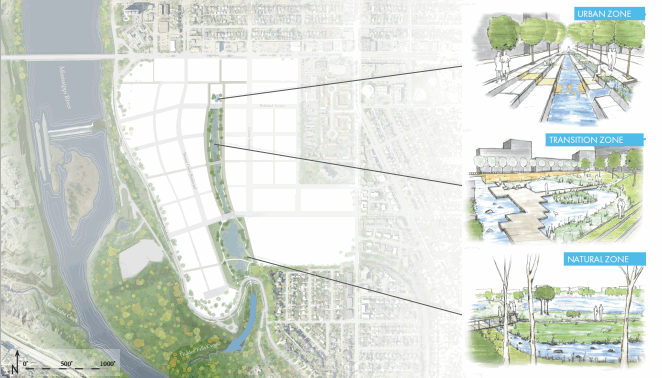 We're especially pleased with the proposed linear stormwater feature/pond and associated open space, that will provide an interconnected greenway/waterway as a central feature of the site. This water feature, pictured above, will connect to Hidden Falls Park and help draw people toward the river. A proposed Mississippi River Boulevard bridge over this water course will enhance the integration of this feature with the natural falls. This aspect of the plan is very popular and will be a distinguishing characteristic of the new development. One area where FMR believes the city's plan is not ambitious enough is the lack of increased park and open space at the blufftop. The existing parkland strip along the bluff and riverward of Mississippi River Boulevard is very narrow, leaving little room for park activities, overlooks, picnic facilities, and other amenities that new Ford site residents would surely appreciate. FMR urges the city to move Mississippi River Boulevard slightly to the east to create a more expansive blufftop park. Unlike the ballfields or neighborhood parks that are part of this plan, this expanded public parkland could be eligible for Regional Park acquisition funds through the Metropolitan Council, thereby not requiring as much contribution from developers or St. Paul taxpayers. Planning for a new Riverview Corridor transit route that would connect downtown St. Paul with the airport is well underway and could impact the Ford Site. FMR and the National Park Service are advocating that the line crosses the Mississippi at an existing bridge, either Ford or Highway 5, as opposed to building another bridge. It is extremely important that this crossing is designed to minimize impacts to the river bluffs, mature trees and adjacent parkland. While many people are following the Ford redevelopment process, we've been surprised by how few are aware that a portion of the riverfront parcel known as "Area C" contains a toxic waste dump that has not been cleaned up. Ford Motor Company and the Minnesota Pollution Control Agency are conducting environmental testing at the site, the results of which have not yet been made public. FMR has requested that the city share the results broadly with the public and devote time in Ford-related public meetings to inform people of the potential risks and liabilities associated with this legacy of pollution. Redevelopment of the Ford site presents a rare opportunity to create a new riverfront neighborhood that enhances and is in turn enhanced by the great Mississippi River. We'll continue to monitor and engage in this important decision-making process. Look to future Mississippi Messages for updates. 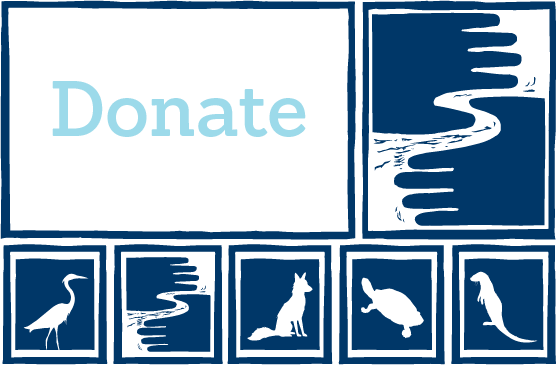 And if you'd like to be informed of opportunities to weigh in on this and other development and land-use issues impacting the Mississippi River, sign up to be a River Protector and select "Send me action alerts on city and local issues."